Chocolate cake is a delicious and comforting dessert. While using a cake mix recipe to whip one up is an easy option, nothing beats a chocolate cake made from scratch. Whether you’re baking one for a birthday party, another special occasion or just because, your family will love this treat. Follow our recipe below on how to make a chocolate cake from scratch. Set out the butter for the frosting as early as possible to let it soften. Take out two 9-inch round baking dishes, then grease and flour them. Shift the pans around until the flour sticks to the butter and covers the entire inside. You should be generous in this process so your cake doesn’t stick to the pan when it’s done. In a bowl, combine the sugar, baking soda, flour, sugar, baking powder, and salt. Stir the mixture until the dry ingredients are well blended. In a separate bowl, combine the eggs, milk, oil, and vanilla extract. Whisk them until they’re well combined, then add in hot water. Combine the wet and dry ingredients in the larger mixing bowl. Use a large spoon or hand mixer to blend the ingredients. Pour the batter evenly between the greased and floured 9-inch baking pans. Bake the cake for 30 minutes. To check if it’s done, stick a toothpick in the center of each cake. If the toothpicks come out clean, the cakes are done. If batter sticks to the toothpicks, put the cakes back in the oven and bake them until a toothpick does come out clean. If you don’t have any toothpicks, you can also use a metal knife. While the cakes are baking, make the frosting. Mix up the butter in a mixing bowl until it’s fluffy and light. Beat in the vanilla extract, then add your confectioner’s sugar and dark cocoa powder. Add 4 or 5 tablespoons of milk and beat again. Pour in milk to get the frosting to the right consistency — it should be creamy, and not too stiff or too runny. Once the cakes have cooled, run a knife along the perimeter of each cake. Put the wire rack over the top of the round pans and flip it upside down. Let the cakes cool another hour. When the cake is entirely cooled, frost it and serve. If desired, top with fresh fruit and glaze. 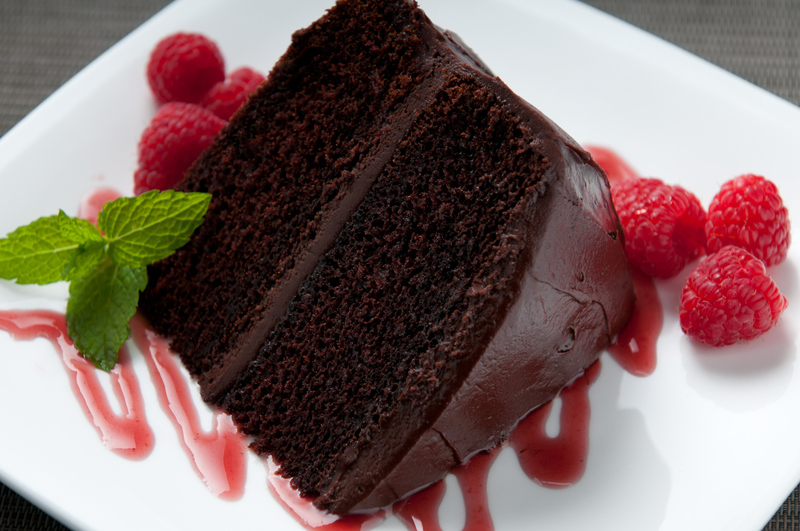 Make sure you use Sauder Eggs when making this easy chocolate cake recipe. When baking and cooking with our eggs, you never have to worry about quality. Use our store locator to find the closest store today.